M is We returns to Silber to face the 5in5 challenge. Post punk & proto goth from Michael Wood & new band member Michael Madden (guitar). Christian Death meets The Germs meets Cabaret Voltaire, what more could you want in five minutes except a longer ride? 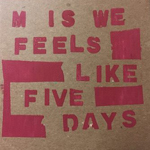 Feels Like Five Days, by M is WE, is the latest release in the Silber Records 5 songs in 5 minutes series. The tracks are dark, heavy, post punk and definitely leave the listener wanting more. With influences from The Clash to The Ramones, the tracks are pure post punk goodness. The 5 in 5 series has been one of the more interesting label series in recent years, with a myriad of exciting content. M is We delves into late 70s post-punk grime on the darkness of “Feels Like Five Days”. Grungy to its very core these are songs that allow no light. By letting the songs center strongly around the discordant riffs and catchy rhythms, there is a disorientation that occurs throughout. Far-off vocals add to this sense of everything remaining unclear, as if the songs appear to be stumbling through so much pitch black. When M is We allow themselves to amp up the volume to shout as loud as they want they truly excel. Even within these very messy chaotic arrangements there is a pop sensibility buried deep within it all. “Three Hour Weight, 30 Second Ride” starts the collection off on a high note. From the ominous threat of the plodding guitar riff, the song explodes in furious violent color. Everything feels quite visceral as that initial burst of color fades away into the infinite. For “Tired” M is We unleash a catchy hook that comes to anchor the song in a far-off, spacey sound one that gives the song a dreamy quality to it. Absolutely bombastic is the blistering speed of “Princess Frown”. Easily the highlight of the collection it deserves to be blasted. Ceremonial in its execution is the creepy “Bled Bleed”. With “Fading” Me is We closes the collection off on a disorientating note. Recalling the burst of energy that defines the best of the Wire’s work, M is We delivers potent post-punk on “Feels Like Five Days”. The US gothic-sludge project M Is We released the EP Feels Like Five Days on the 14th. Without going in to too much of a loop – longer readers of the website will know how regularly releases on Silber Media appear, those who aren’t – they do. A series of EPs going back over many years and continue to be recorded which are released by Silber under the collection 5in5 which are challenges to bands who often release tracks with time-capsules extending towards the duration of the phases of the moon to come up with five songs lasting five minutes in an EP release. 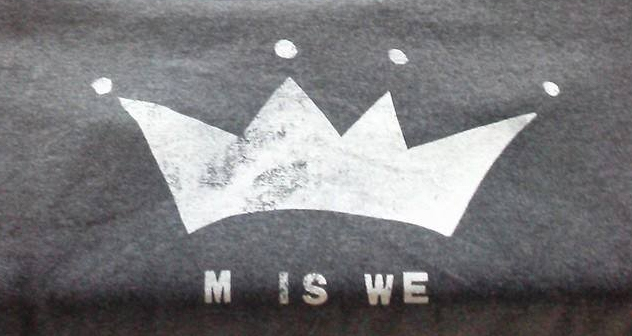 M Is We, who were introduced last year with a song that stretched towards the complete running time of the whole of this release – took part in the series with the release of Feels Like Five Days (available on bandcamp) and the second track is Tired.